You buy a new fridge. It’s a double door, mirror effect and dispenses water and ice-blocks. Top of the range. Three months down the line, the fridge packs up for reasons only known to itself. The teller slip where you bought the fridge is gone. So is the box. So is the little card you found with the instructions for the extended warranty. If you paid cash, you have no proof that you bought this fridge. You bought a dud and it’s going to cost what you paid for it the first time to get it fixed. That’s how important records keeping is in a company. Absolutely crucial. If the company cannot prove payment, prove orders, prove suppliers have been paid, they will be forced to do so again. 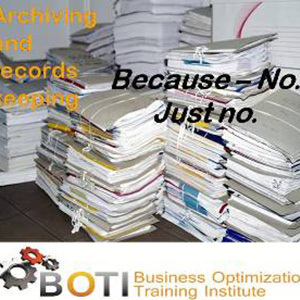 BOTI’s Archiving and Records keeping workshop is a must do workshop for any company who needs to keep physical records. We offer a tailored course to get your records and archiving office up and running properly in no time at all. This course is intended for anyone working in the records department.